This past weekend in Durham, North Carolina, the good folks at The Foreign Exchange held a private concert for around 30 of SOME OF their closest fans. It also doubled as a recording for a future 'live' album that they plan on releasing for their FANS to enjoy. I was lucky enough to be able to attend this event. This is going to be my 'ramblings' on the event that took place on Sunday February 20th around 6:00 P.M. Unfortunately, I was NOT able to take my camera inside and NORMALLY that would put a damper on my personal spirits as I HATE TALKING ABOUT EVENTS without visuals. However FE had cameras ALL AROUND and some photos were 'leaked' out so I do have some visuals to work with. Before you say it, these are people I consider MY FRIENDS too at this point so I was not about to go 'rogue' and start disrespecting their rules. So no, I don't have many pictures of my own on this go around. I know I said I planned to take some. I got something better though. The experience. I mean after writing about their music here on the blog & seeing them perform, I STILL am blessed to have seen this event. So it is a MORE THAN FAIR TRADE OFF for me. Besides, when I tell you that there were cameras EVERYWHERE...I am not lying. When that happens, I will post some up here and link you to the rest. @ the rest of the photos coming out. Sunday evening, I was reminded of Nick and Norah's Infinite Playlist, where the film's stenciled white rabbit graffitied around Brooklyn pointed the way to a secret performance from the fictional, enigmatic indie rock band Where's Fluffy? 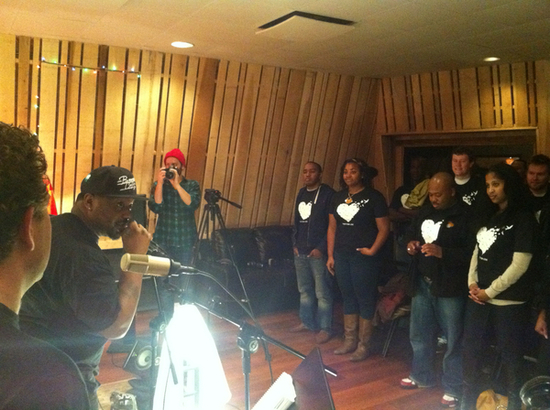 But standing on Washington Street in Durham, instead of Fluffy, letter-size sheets of paper emblazoned with The Foreign Exchange's signature plus sign pointed the way to an exclusive, invitation-only performance from the R&B band at SoundPure Studios. As the clock ticked closer to 6 p.m., a line of 30 or so people who traveled from as far as Cleveland for the event formed outside the Durham recording studio. And as the line began to snake down Washington, the air of mystery grew with anticipation of what to expect of the evening ahead. We highly recommend you read this excellent recount of The Foreign Exchange's private concert in Durham NC. On a whim I submitted an email last week to an open call contest for a private FE concert. I figured, what could it hurt? I never win anything anyway. I would have loved to see them again because I learn something new every time I see them live, but come on: it's an open call to thousands of fans, spread out over multiple social networks, taking place five days after the call, all the way in North Carolina. Let's be extremely conservative and call it a one in ten thousand shot. This is a Grammy-nominated group we're talking about here. 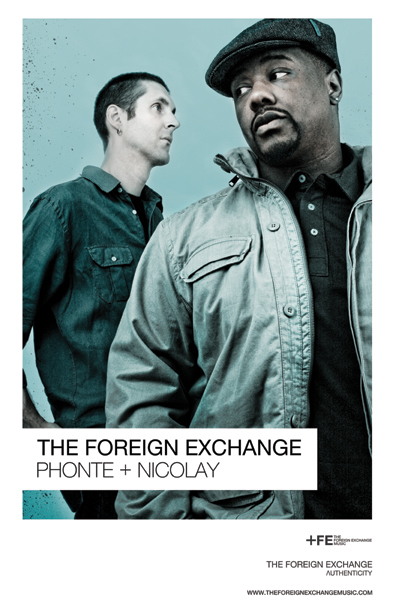 The Foreign Exchange are critically-acclaimed Hip-Hop duo Phonte Coleman and Nicolay. Their soulful sound has captivated listeners over the course of three exceptional albums, and even earned them a Grammy nomination in 2010. Redtop caught up with them last month whilst they were in London playing their first shows in the capital in over five years. Upon returning home from last night's Foreign Exchange gig at the Paradiso (Amsterdam) I realized that what I had been witness to was not only a great performance, but also a family reunion of sorts. Mom and Dad Nicolay (as Phonte referred to them) were joined by friends and family to welcome home their multi-talented son Matthijs Rook (a.k.a. Nicolay) and his band of highly gifted musicians and vocalists. Also contributing to the intimate nature of last night's homecoming was the venue. Percentagewise I'd say the attendance was about 50%, which is a good thing as it gave the audience the room to freely move around and fully enjoy the performance. As opposed to the crowded and noisy sold-out concerts that are usually held there! All these circumstances gave the evening a warm and even emotional undertone that elevated the entire experience that much more. The Foreign Exchange show also happened to be my first concert in 2011, and I couldn't have hoped for a better way to start the New Year. If you are not into The Foreign Exchange or you have not heard of them then fix up! Truthfully I cannot carry on in the same way that smokers who give up suddenly become the biggest patrons of abstinence. It was only an introduction to The Foreign Exchange by my sister Tochi that initially got me interested. However once I had heard them I was hooked: once you go Foreign, you never go back. Over in the UK after a prolonged period away to promote their new album Leave It All Behind I got a chance to see them perform at Cargo. Comprising of the ultra charismatic emcee Phonte and the quietly brilliant producer Nicolay, The Foreign Exchange are totally sublime. Their sound is like some ultra expensive velvet as it caresses your senses to a brilliant level but live they take their sound to a whole new experience. Even though Phonte admitted they were absolutely bush wacked after five days of touring over Europe the energy, vibe and vigour with which they performed was off the hook. It was 90 minutes of pure niceness. The highlights had to be when they dropped what seemed like spontaneous digressing jams, that just fully exposed the talent of the whole ensemble in The Foreign Exchange. The group were professional, talented and a joy, it was a great night.